A Dutchman known as Jan Le Loup (John the Wolf) was burned at the stake on this date in 1607 as a werewolf. In a Europe where wolf attacks were still a real threat, the werewolf superstition waxed in partnership with the witch superstition. “Werewolf witch trials” form a distinct subspecies of the regular old witch trial; one of them even constitutes the maiden post of this here execution blog and it’s not very difficult to imagine predatory megafauna terrorizing a region could be attributed supernatural powers; the occultist Montague Summers devoted a whole book to plumbing the records of bygone werewolf cases for evidence of genuine lycanthropy. Werewolves could likewise be rolled up via the familiar machinations of the witch-hunter. 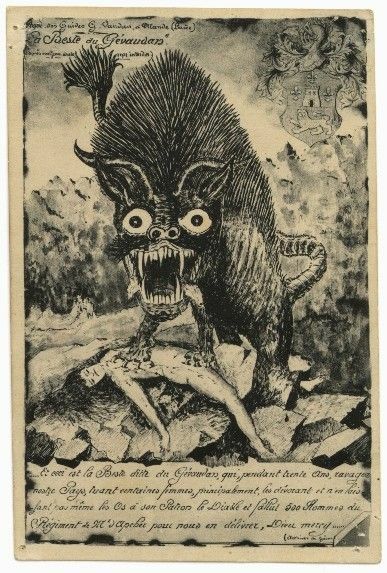 In John the Wolf’s case, he was accused out of the trial against Henry Gardinn of having used their transmogrifying beast personas to devour a child in Limburg. Gardinn burned in 1605; John was able to flee to Heusden but was recognized in 1607 and returned to Maastricht for the inevitable. Though John tried claiming that Henry’s indictment had been to revenge himself for an altercation between the two, torture soon changed The Wolf’s story and placed he, Gardinn, and a third companion into a forest coven with a devil-avatar with whom they danced and feasted on human flesh. After execution, his remains were exhibited on a pole surmounted by a wooden illustration of a werewolf.